When I reached the Bijapur station, it was totally the opposite of what I had imagined. It has everything that caters a backpacker’s need - Locker rooms, Retiring rooms and well connected with trains. (What else do you want?) As I didn’t book any room, I headed towards the cloak room. Then I realized something. They won’t keep bags without a Lock! So my next task was to buy a lock for my backpack. Fortunately, without much roaming, I got it from a shop, right in front of the railway station. I went to the cloak room, locked by backpack and met with the cloakroom attender. He gave me a receipt and asked me to keep the bag with the receipt over it, in a table at the corner. Then I headed towards Gol Gumabaz's whose dome was visible from the railway station exit. As I started walking towards the Gol Gomabaz, it seemed to me that, after each and every step, the monument is moving farther and farther away from me. Finally, I asked an auto driver, the Gol Gumaz main entrance. He showed me the way and offered me a trip to the entrance for 10/- rupees. I declined the offer and preferred to walk and within just 10 minutes, I reached the main gate of Gol Gumbaz. By that time, the temperature and the dust of Bijapur took a toll in me. 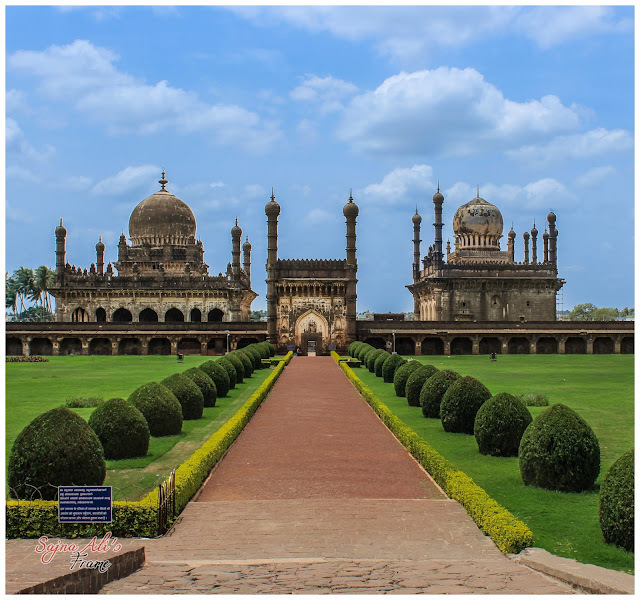 When I got back with the entrance ticket for my Camera, a person (definitely a guide) approached me with a brochure showing the main attractions of Bijapur. He offered rupee 450 for a trip in his " tonga " (Horse cart). I chose to accept his offer which later proved to be a good choice, when on the way, I started calculating the distance between each monuments at Bijapur. I can definitely say that it’s better not to cover these places by auto or by foot, especially in that scorching sun. The deewan waited for me in front of the Juma mazjid untill I finished roaming around the mazjid (mosque). I was the only tourist there at that time and that offered me some good great snaps. While roaming, I met another person who came to offer namaz (prayer). He was going on and on about the mazjid. He told me that, at a time, the mosque could accommodate 2200 people to offer namaz here. This number is bigger than the Delhi Jama mazjid. So he claims that I am currently standing inside the second biggest mosque in India ! The first one is at Bhopal . The Central Mihrab on the western wall is inscribed with lines from the Holy Koran and is etched in gold. When I got out of the mosque, my deewan and his horse, Muskan, were waiting for me. They were ready for the next destination, the Gagan Mahal, which was used as a Darbar hall during the ruling period of Adil Shahi. It has a well-maintained lawn. While clicking the photos of Gagan Mahal, I met a sweeper who was cleaning near by other monuments. When I engaged her for a small chitchat, she warned me when I told her that, I came in a tonga . She said "zamana acha nahi beta, apna ghayal rakhna". (Take care of yourself dear. The world is not a nice place). I ignored the first signal of uneasiness from her and headed towards my Tonga . My next destination was Hazrat Syed Sha Abdul Razak Quadri dargha. This was also known as Jod Gumbaz. Here entry for women were prohibited. While I was checking the walls of the same, I heard some men making sounds and shouting something. When I ignored it and moved ahead, a lady came up to me and told me in Hindi that, the men were shouting at me as I was walking with my sandals near the dargha. This is also prohibited as well! Taj Bawdi, was the only water resource I saw in Bijapur. It was said that it was a well-maintained royal swimming pool when the bus stand was close to it. But when the bus station was shifted to another location in the city, the local people started using the pool for their needs and kept it untidy. During Vinayaka Chathurthy, people use this pool for nimanjan of the Ganapathi statue. So, in total the water is being polluted day by day. And, it is hard to blame anyone other than the authority who is not maintaining the pool. The Bijapurians haven’t seen rain in the recent years and their only water source for now is the Kudalwaram dam which I crossed on the way from Badami to Bijapur. Non Bijapurians comes here either as a tourist or as a student to the Al Ameen medical college. On the way to the Ibrahim Rouza, the deewan showed me the Jal Mahal. It was a water fountain during the royal period. Ibrahim Rouza wasn't in his list, but I asked him to include that in the trip with “some” extra charges. His reason for the extra charge is that Ibrahim Rouza is situated outside the fort! 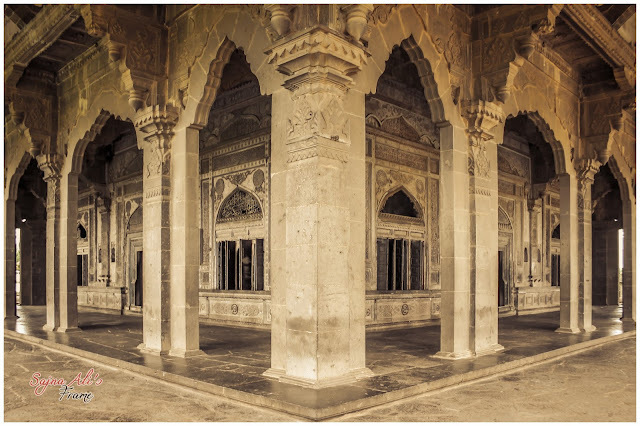 In many songs and stories, I have heard people asking "Shajahan built the Taj Mahal for his beloved wife, Mumtaz. But did any women make any monument for her loved one?" If asked now, I would love to answer this question with a big “Yes!” (With a capital Y, of course!) Ibrahim rouza is a prime example for that. 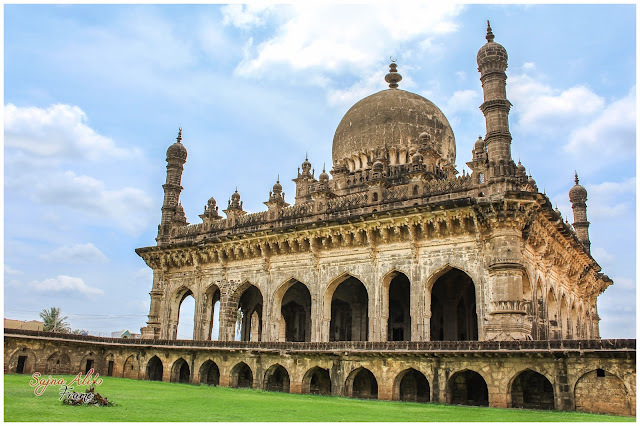 It was built by Ibrahim Adil Shah II for his wife, Taj Sultana. But during the construction, the king expired and his wife completed the structured and named it after him. The Indo Islamic architecture is used for the construction of the Ibrahim Rouza. The building consists of a tomb and a mosque within a square enclosure, the whole forming a garden retreat. There is a common belief that Ibrahim Rouza inspired Shajahan to built Taj Mahal. Ibrahim Rouza offered few fine shots of Parrots from its upper corner of the mosque. After the visit to Ibrahim Rouza, I covered my head and face with my shawl as my dust allergy was getting back in action. The legendary "Malik-i-Maidan" was the next destination and their cannon is stated to be the largest piece of cast bronze ordinance in the world which will stay cold in any temperature. On the way to Upli Burz, the deewan told me that this name came from the locals as they used this view tower wall for drying the cow dung. The actual name of tower is Hyder Burj. If you reach the top of this monument by climbing 72 stairs, you can see a panoramic view of the city with two cannons from the old era. After seeing the city from the top, we decided to go to Bara Kaman. On the way, the deewan stopped for a break with some fresh sugar cane juice. Then the journey was through the heavy traffic city and finally it stopped in front of the Bara Kaman. Here also, the king wanted to build a 12-storied tower but unfortunately, he died after the construction of the first floor. His tomb lies inside this structure. The arches of this structure are really amazing! 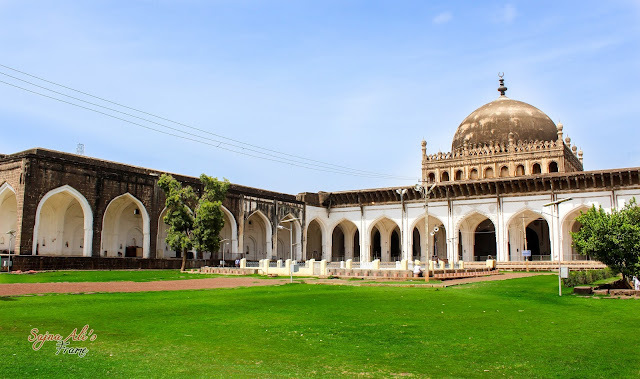 Gol Gumbaz will welcome you with a sight of a building that has a dome, but getting closer, you can see that its two buildings. The first one is a museum and the dome is that of Gol Gumbaz's which is at the backhand side of the museum. 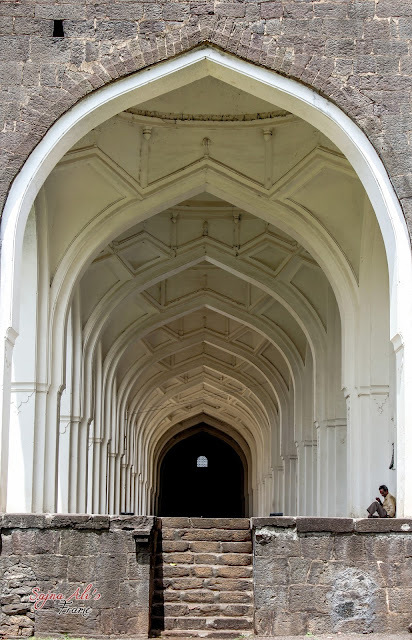 When I stepped into the main entrance of the Gol Gumbaz the security stopped me after a quick question "Are you alone?" When I said yes, the woman who checked me said that I was not allowed to enter the tomb alone. I was dumbfounded with her announcement. Then I talked to the head of security saying that I am coming from such a long far away place and how am I prohibited to visit this monument? Finally, after convincing the head to allow me enter the monument, the lady security who stopped me was still blabbing to them in their local language. With a triumphant look, I entered the Gol Gumbaz. The architecture of the Gol Gumbaz was amazing and you can hear the loud noise of visitors when you enter the ground floor. When you look at the top of dome from near the tombs of Muhammed Adil shah and his family, you can see the visiting gallery a.k.a whispering gallery. The reason for that name is, if you make any sound from one corner of gallery, it will be clearly audible to the person at the other end. Hence, the visitors were making use of this and it was totally noisy when I got into the whispering gallery which is at the seventh floor! It was funnier to find the entrance to the staircase that leads to the whispering gallery with 50 broad big steps! I roamed around the tomb 2-3 times to find the "way-in" board at the right hand side of the main entrance. I put my ears close to the wall of whispering gallery. But for me, whatever I heard were what were “whispered” from the other end of gallery by unknown persons. It was not at all understandable. After spending few more minutes at the whispering gallery, the well-maintained lawn and the museum, I slowly started walking towards the railway station. In between, I met some Maharashtrian families at Gol Gumbaz and waved them bye with no hope of meeting them again elsewhere!